2017 team preparing to climb Mount Taurus in Cold Spring. My son Laszlo is holding the stick on the far left. On June 15th, I will complete my last task as head football coach at Brooklyn Tech by representing our school on the staff of the Empire Challenge All Star Football game. Participating with me will be Shafia Langford and D’Avian Clayton. As the end comes near, I have been reflecting a great deal on what this football program and school have meant to my family over the last ten years. Me and Laszlo at halftime in 2009. When I began at Brooklyn Tech in February of 2009, my wife Winnie and I were expecting our first child in July. I am grateful to Principal Randy Asher, who worked hard to make sure I could get into the school as soon as possible. The first six months were very hard. I had to make an adjustment to a new school in the middle of the year and get to know the team and the coaches that continued on after Coach DiBenedetto decided to retire. Everything was new and being done for the first time; the first off-season, the first spring practices, the first summer. I will always remember the first classes that I taught at Tech, classes that included the future Director of Sports Information Katie Blitz and managers Jia Wen, Suzie, and Sharon. They brought on Mabel and Anita and our first student support staff was created. They worked so hard in their roles and set the model for those that followed them, like Elaine, Princess, Elizabeth, Danielle, Tiffany, Christine, Zaria, and Nicole, to name a few. Those members of the support staff were as integral to the program as any coach or player. Mabel, Sharon, Katie, Jia Wen and Suzie in 2010. That first six months, I spent a lot of time getting to know Brooklyn Tech and Brooklyn Tech spent a great deal of time getting to know me. I became familiar with Fort Greene, got used to seeing Spike Lee on the street every other day, and began to settle in. I was introduced to alumni and faculty alums, such as Liz Sciabarra, Matt Mandrey, Sue Mayham and Brian Cosgrove. I met the Cuzzocrea’s and the members of the Adam J. Cirillo Foundation board. I made friends with Patric Denis, Maurice Holland and Pierre Oneil after I began working with David Newman, Bill Givens and Phyllis Witte in the Dean’s office. I talked philosophy with Adam Stevens, Serge Avery and Richard Stein. I covered classes for Beth Malciodi and Lauren Williams, who taught me a lot about anthropology and psychology, respectively. Spent time figuring out budgeting with Debbie, Christine and Steve in the procurement office. That July, Laszlo was born. He has since grown up as a part of the Tech football program and is a constant reminder of how quickly time flies. The west view from room 8w14. This became the football office in 2010, following a year of sharing 1c3 with Dibo. I have had countless phone conversations while staring out the window from this point of view. We were blessed with tremendous success our first year and the 2009 team finished 8th in the city and hosted a playoff game against Lincoln High School. The following year included two epic games against Jefferson High School, the second of which was a double overtime thriller that left long-time coach and alum Joe Pangia saying it was the most exciting game in Tech history. That win brought the 2010 team to the quarterfinals where we lost to the eventual city champion Fort Hamilton Tigers. Players like Michael Plonski, Terrance Taylor, and Denzel Mclarty to name a few, were all-city players over that period. Joining the Brooklyn Tech staff around that time was my good friend Jennifer Sullivan, who had come from Sheepshead Bay and taught in the Social Studies department for a year before becoming AP of Organization. Jen introduced me to Floral Park which eventually led to my family buying a house there. Laszlo K. McKenna in the 8th floor office circa 2010. Laszlo on Coach Brown’s motorcycle circa 2012. The 2011 season started with Hurricane Irene cutting training camp short. The team won its opener, but lost the next four and at was looking like it may be the first year that our staff would not get the squad to the playoffs. However, the Neers rode the late season momentum of a win against Jefferson (in an October Blizzard!) to another playoff appearance against Tottenville. An October 29th blizzard began 30 minutes before kickoff. We refused to let the commissioner, who was on-site, cancel the game. We won the game 8-6. The following off-season would see the implementation of the Vesting Program, something that would come to define the culture of the program for years to come. Vesting created a large group of first in, last out (FILO) guys that were willing to invest in their success each and every day. It also made us a strong football team that was built to push people around. Laszlo looks on after a scrimmage in 2011. With the nucleus of the 2011 team returning for 2012, high hopes were placed on a team that possessed three Division 1 football players and a very solid supporting cast. Brandon Schneider and Chaz Perry vs New Utrecht in 2012. However, 2012 could not have started worse. The squad fell to Jefferson in the opener and Kennedy in the second game of season. As a featured part of the Vinny Aceto “On the Sidelines” radio show, I had to get on the radio each week and talk about high expectations falling short. Prior to week three, Vinny brought in a special guest from my past to bring the mojo back; former Head Coach Ed Gazzillo from my days at Grand Street Campus. We spoke about all the ridiculous rituals I had followed for years and how it was time to get the mojo back. Starting the next Saturday afternoon, the Engineers won seven straight games, including a home playoff game against JFK that avenged the loss from earlier in the season. The team dealt with the circumstances of Sandy, with some relocated and others dealing with great loss. Laszlo checks out the team after a 2012 win. In a second quarterfinal trip in three seasons, Tech fell to Tottenville to end the season. James Gales went on to Princeton, Thomas Plonski to Villanova and Kyvaune Brammer moved on to Fordham to play for Coach Joe Moorhead. With team success came a great deal of individual success and accolades. Benjamin Haye won the Adam Cirillo Scholarship, the Chase Smart Start Scholarship, was named to the National Football Foundation’s NYC Elite 11 and he did all this as a role player and captain. James Gales received the Wingate Award for the best high school football player in the PSAL. The Daily News even named me Brooklyn Coach of the Year (Honorable Mention…). That team was loaded with outstanding football players; Shaq Williams, Justin Minucci, Kareem Ellis, Adham Ali, Tyler Dougherty, Brandon Schneider, Chaz Perry, Zarique March and so many others. It was an amazing year with an outstanding group. Justin Minucci and Tyler Dougherty following a 42-0 win over Fort Hamilton in the “Occupy Fort Ham” game, Something that me and Coach Wock from cheerleading came up with. We had t-shirts made as well. Those shirts are collector’s items now. The 2013 season was played under the slogan “We Climb Mountains” after the team took on Mount Taurus in Cold Spring, NY, for the first time. The players also got out into the community more than ever, hosting a Punt, Pass and Kick contest for Brooklyn youth. We were able to travel out of state for scrimmage in Woonsocket, Rhode Island. I was able to compete against my college teammate Carnell Henderson, who was the head coach at Woonsocket at the time. Throughout my time at Tech, I have been able to compete against and work with another of my Boston University teammates, Peter Gambardella of Curtis High School. Players gather around wood sculpture at Woonsocket Field in Rhode Island, following the huge cookout the two teams had following the 2013 scrimmage. The 2013 team fell short of the playoffs for my first time as coach, but was a talented group with several seniors that went on to be successful college football players. Tristan Brown finished as the 5th all-time leading rusher for Ithaca College this past season and Deon Mash returns for his senior season this year at LIU-Post. Jeff Bunditwong went all-city as a linebacker on defense. Rising stars Lawrence Menyah, Brian Gill, Elijah Rueda and Alpha Gamby were starting to show their potential at the end of the season. Laszlo walks to the field with the players in 2014. The 2014 campaign saw a return to the playoffs and some incredible stats. Elijah Rueda lead the PSAL in completions, Lawrence Menyah was #1 in total receptions and Alpha Gamby was #5 in total receptions. Brooklyn Tech had been known for over 80 years of triple option run game and was now at the top of the PSAL in passing categories! I can’t tell you how many envious alumni receivers chimed in about that. We opened up 3-1 that season and were going strong before Elijah Rueda suffered a season-ending knee injury. Lawrence Menyah went on to play football at Fordham University and Brian Gill led the PSAL in tackles before he went on to Ithaca College. Nico Fuertes ended a great career as a kicker at Brooklyn Tech. Nico was so good that when we used our long-practiced “Cajun” fake field goal (in honor of Les Miles), Max Nelich threw a shovel pass to Brian Gill for a touchdown. I think that Max may have the highest QB rating in Brooklyn Tech history. In that year’s playoff game against Grand Street Campus, freshman Michael Marcovici made his debut as a varsity quarterback. He didn’t fare too well, but his next playoff game would be a bit better. Injuries plagued the 2015 season, while a young crew of sophomores gained valuable experience. I met Cassandra Giraldo one day while the team was walking to practice at Commodore Barry Park. Already an accomplished photographer, Cassie went on to take fantastic photos that would become a time capsule of the season. I was also privileged to work with other amazing photographers and film makers such as Eric Ryan Anderson, An Rong Xu and Bon Duke. Shana Stephenson covered the team for allsportseverthing.com for an entire season. Greg Thompson, Kurt Semder, Dan Serafin and especially Pat O’Keefe, always made sure that Brooklyn Tech was prominently featured on News12 Brooklyn. Pat created a feature segment on our female football player Kassie Pena, bringing her story to the public. Vinny Aceto featured us on his radio show and later helped me with my Coaches Show podcast. Vinny is a great friend and I am grateful for him. We failed to make the playoffs in both 2015 and 2016. I was incredibly disappointed for these teams because they had good leadership and work ethic. Peter Henderson will go down as one of the great men of Brooklyn Tech football. John Hemminger, Paul Pianin, KC Vasilas, and Henry Kamornik, were also great engineers and wonderful players to be around each day. Malcolm Davis’ return to the program from Xaverian in 2016 was a huge boost to our weight room culture and could be seen on the field as we built our groups of “Tanks”, “SARs” and “Air Force”. This picture is from 2015 Springfest, two days after my daughter Phoebe was born. 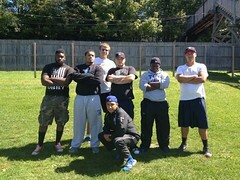 Ryan King, Shon Knox, Oneil Williams, Laszlo, Adam DiBenedetto, Matthew DiBenedetto, and Malcolm Davis at Training Camp in Equinunk, PA in 2016. In 2017, it was time for our senior class to finally have their time in the spotlight. Many of the games that we played in 2017 were rematches from the year before. Unfortunately, the first two games of the season were close games where we did not come out on top. Game three had us at home against the Curtis Warriors and that resulted in a loss, but saw Ned Stimpson score two touchdowns on the back to back city champions. Ned, who at one time was almost unable to play because we didn’t have small enough equipment, was starting to become an explosive receiver that was demanding double coverage. By game 8, we had very little shot at the playoffs and two games remaining, but we had refused to lose faith in ourselves. We pulled off a tough win against Canarsie. It took away some of the sting of the controversial loss the year before, but it more importantly set up a instant classic with JFK. After a 0-0 tie at halftime, Brooklyn Tech and JFK played through two overtimes leading to a Brooklyn Tech win at 30-28. The win magically vaulted the Neers into the playoffs as the 12th seed. It would be Michael Marcovici’s first playoff game since freshman year at Grand Street. We would take on Tottenville in the first round. A blood-stained Michael Marcovici following our double-overtime win at JFK in 2017. Marcovici and Stimpson would both go on to have their best offensive games of their careers at Brooklyn Tech. Stimpson’s 9 catches for 152 yards is the best single game performance by a receiver at Brooklyn Tech in over ten years, regular season or playoffs. Marcovici’s offense performance (passing – 19/34, 234 yards, rushing – 14 carries/100 yards) was a career best and the most single game completions, passing yards and total yards by a player in over 10 years. Even though it ended in a loss, I couldn’t have been more proud of our team. For years, I had been trying to get to the point where the players just let loose and played. That game was as close to that feeling as one could expect. Most importantly, everyone involved felt good about the experience they had while playing football. A football player’s experience was always what was most important to me. I wanted anyone involved with this program to feel that they had the best possible high school football experience available, as long as they were accountable and put forth the effort. I know these are high expectations, but I believe that we achieved them more often that we did not. Laszlo and Phoebe at Charles Wang field in 2017. I need to thank some people that have always helped the program. Thank you to Randy Asher for taking a chance on me. Your confidence in my ability to do the job was a constant source of motivation. Thank you to all of the coaches that have helped me to prepare these student-athletes. Our cheer squad was part of our team and its coaches are part of our crew. Thank you so much Caitlin and Michelle for always buying in and celebrating our two team’s special relationship. Thank you to Jay from Bakers Dozen Bagels for providing bagels for all of the pre-game meals. Thank you to Jay Rappaport for always looking to give us a statistical edge. Thank you to all of the parents that played a crucial role in the parents football club, your hard work for your kids was appreciated by both them and me. Thanks to the PSAL for listening to my opinion and realizing that I always had the kids best interest in mind. Thanks to the New York City Football Coaches Association for allowing me to serve the coaches of this city. Thank you to Al Paturzo and the NY State High School Football Coaches Association for allowing me to represent our region on the state board. Thank you to the Boomer Esiason Foundation for allowing me to help play a small part in making life better for those living with Cystic Fibrosis. The opportunity to coach with my father has been one of the greatest parts of my experience as head football coach at Brooklyn Tech. Being able to spend such quality time with him each day was incredible. The help and counsel of Jim DiBenedetto, Chris Colombo and Charlie Pomaro throughout the years was greatly appreciated and always helped me to steer the program in the right direction. My roommates in the football office, Jean Brutus and Jerome Brown, kept me laughing day in and day out. Watching Fordham game in 2016. Brooklyn Tech has given me a chance to grow as a coach, teacher, father, husband and friend. I am so grateful for the village that my son and daughter have been able to grow up in. As you can see from the pictures, Laszlo has come of age around this program. He will always remember the players and the effect they have had on him. So will I. My family and I will be packing up and heading to Mercer Island, Washington, at the end of the month. I will be beginning a new position at Mercer Island High School coaching football and working at the school. I am excited for new experiences and opportunities, but I will never forget the days spent in Fort Greene leading the Engineers. I am truly grateful for every single day I was able to represent this great school and football program.